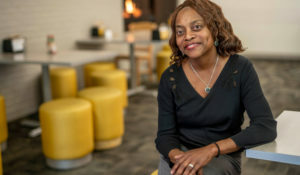 Marilyn Holmes is a friendly and familiar face to the students, staff, faculty and Nashville community members who make a stop at the Vanderbilt Recreation and Wellness Center part of their daily routine. She greets many of them by name as she passes out samples of warm, hearty rice pudding on a cold day in late January. The samples—made with brown rice, almond milk and fresh fruit—are part of “Nutrition Minute,” a program designed to raise awareness of healthy eating and provide Rec Center members with new recipes to try. On average 1,500 members come through the Rec Center’s doors each day—that’s 45,000 visits per month—in addition to the hundreds who hold practices in the Field House, make use of the intramural fields, and participate in Outdoor Recreation trips. Holmes said the Vanderbilt community is passionate about fitness, nutrition and wellness. 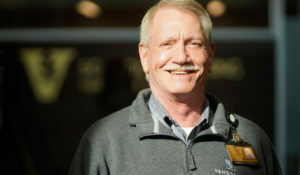 “I love the passion of the folks that I see—not only the students, but the faculty and staff and community members as well. There’s a lot of energy here—a lot of desire to learn, and to learn what’s evidence-based,” she said. 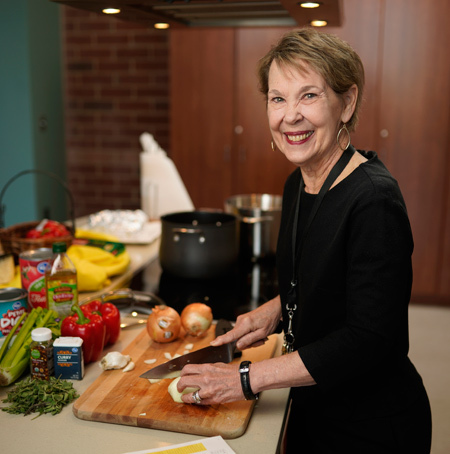 Holmes has devoted her career to nutrition education, with more than 40 years of experience as a registered dietitian and in population health management. Her diverse professional background includes experience in hospitals, nursing homes, an educational institution, and in the public health sector at local, regional and state levels. She serves as a preceptor for the Vanderbilt Dietetic Internship and oversees 16 students annually during their rotation at the Rec. These students have already completed accredited nutrition coursework at the post-bachelor’s and/or master’s level. During their Rec internship, they are completing their supervised practice. These students will be eligible to take the Academy of Nutrition and Dietetics’ registration exam to achieve registered dietitian/nutritionist status upon successfully completing the internship. In addition, the center partners with the School of Nursing for a class that showcases the Rec’s teaching kitchen to demonstrate culinary and nutrition skills to Vanderbilt nursing and medical school students. “We talk about the patient interaction that surrounds the menu and help prepare them to be able to respond appropriately in the clinic when they’re working with patients,” Holmes explained. 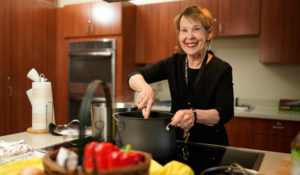 The teaching kitchen is also the venue for the monthly Vandy Cooks healthy cooking demonstrations, a partnership between the Rec Center and Health Plus. The Rec Center serves people of all ages, at all fitness levels, and at all walks of life. Holmes said it’s this commitment that’s made her a proud member of the Vanderbilt community for more than 20 years. “It’s the energy generated by the Vanderbilt University community at all levels—from new and creative thinking, the passion for excellence, and the drive to make the world a better place,” she said.